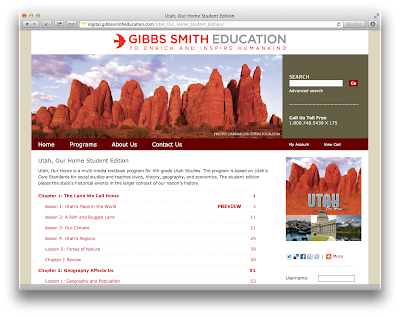 Gibbs Smith Education a publisher specializing secondary school social studies textbooks, needed to find a way to move to digital publishing quickly to meet the requirements of school districts, while ensuring they met the curriculum standards set by each state. As a company that prides itself on Pulitzer nominated authors and meticulous attention to grade level-appropriate content, Gibbs Smith wanted to move to digital publishing in a way that preserved the levels of quality editorial and graphic design that had been so successful in print. Gibbs Smith also recognized that selling material in a digital format would open up new sales opportunities and revenue models, and was determined that any digital effort should be carried out on their own terms and to their own standards, to maintain control over their content and audience relationships. In a matter of months, Gibbs Smith went from a print-centered company to one with a vital and growing new digital product line, which is every bit as much a part of their identity and mission as the books they’ve been publishing for 40 years. To learn more, read the entire Gibbs Smith case study here. Are you looking to move to digital publishing? Let us show you how Tizra can help.